Backed by rich industry experience, we are manufacturing, supplying, wholesaling and trading a vast variety of Silver Exclusive Designer Necklaces. 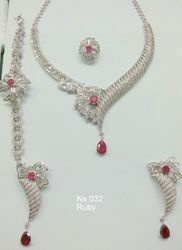 These necklaces are designed following latest market trends using high quality material. The material used in the procedure is sourced from trustworthy vendors of the market by our sourcing agents. Available with us is an attractively designed collection of 925 Sterling Silver Exclusive Necklaces for our esteemed customers. The offered range is designed under the guidance of creative professionals. All these offered necklaces are offered by us in various designs, patterns and polish at reasonable prices. Looking for Silver Exclusive Necklaces ?